The 2 Days Uganda gorilla trekking safari from Kigali city is basically a money saving safari but experiential in that a gorilla permit in Rwanda costs USD 1500 in relation to Uganda’s gorilla permit costing USD 600 therefore our 2 days Uganda gorilla trekking safari from Kigali itinerary is designed to enable visitors in Rwanda experience gorilla trekking in Uganda’s Bwindi Impenetrable Forest at relatively cheaper costs as compared to gorilla trekking in Rwanda, hence this makes our 2 Days Uganda gorilla trekking safari from Kigali cheap and amazing to encounter. This 2 Days Rwanda – Uganda gorilla trekking safari from Kigali takes you to Bwindi Impenetrable Forest well known for Gorilla trekking Safaris in Uganda. Drive through the unwinding hills in rural areas into the home of endangered mountain gorillas. The 2 days Uganda gorilla trekking safari begins from Kigali urban settings into the village setting of Bwindi Impenetrable National Park, this tropical rain forest is a habitat to variety of primate species. From this forest you will track Gorillas while from the other trails you can go for bird watching, nature walk characterized by a number of birds including Blue Turaco, Black casques hornbills, Black and White Hornbills, Woodland Kingfishers, Flycatchers. Time permitting take on a community visit is also much amazing to explore the lifestyle of the indigenous people and Kigali Memorial genocide ground where over 25000 Rwandese were buried. You will be picked by our guide or company representative from air port upon arrival or your hotel of residence, have a city tour at the Kigali genocide memorial and then proceed to Bwindi Impenetrable Forest in South Western Uganda. En-route view of the beautiful scenery, terraced farming to Bwindi Impenetrable National Park home to half of the endangered mountain gorilla. Diner and overnight at Buhoma Lodge or Mahogany springs (Luxury lodge), Engagi lodge/Silverback Lodge (Mid-range lodge), Buhoma Community Bandas (Economy lodge). Meal plan: Half-Board. Day 2: Gorilla tracking in Bwindi forest. Early morning cup of coffee, then prepare for the briefing from the Uganda wildlife officials and thereafter enter the jungle to search the shy mountain gorillas and enjoy their life style in their real home. After meeting the gorillas, you can sit around these great apes for a whole hour gazing into their big round eyes. On a gorilla safari, a reasonable degree of fitness is required as well as walking shoes, packed food and mineral water, insect repellent, sun screen and hut. 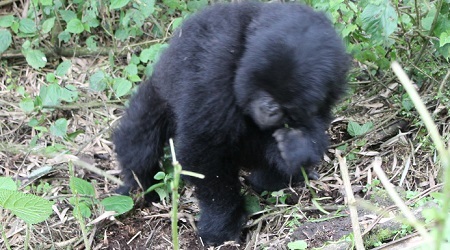 The gorilla tracking experience takes half or whole day depending on the movement of these primates. After this gorilla tracking experience in Uganda you will have informative memorable experience in life. In the afternoon you will have lunch and transfer back to Kigali city and either be dropped at your lodge or at Kigali International Airport to catch up with your evening night flight. End of service! 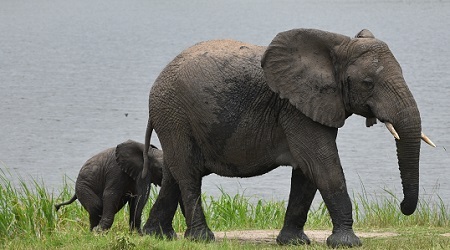 1 liter bottle of mineral water per day per person during safari. Air fare, Visa, drinks, laundry, tips to local guides, telephone, porter fee while trekking, personal insurance, personal shopping bills and cigars.